Our family LOVES to go to amusement parks. We are a foster turned adoptive family that is always looking for an experience that will bring our family closer together. After all, we have an obvious disadvantage – we haven’t all known each other since the kids were born. However, the issue that many families experience is the fatigue that comes along when all of your senses are being bombarded. Now let’s throw in sensory processing issues that have born out of trauma. It’s almost like planning to run a marathon with the general populous but you have a broken leg. I have had it explained to me best that going through life with sensory processing issues is like walking through the center of a crowded midway at a carnival. Bright colors are everywhere. People are moving all over the place. There are flashing lights, puffs of smoke and so on. Did we already mention the crowds of people? They’re constantly bumping into you. There could also be extreme heat outside and then into cold air conditioning in buildings. Roller coasters, 3-D or 4-D rides and so on are all designed to take us on adventures where we are spun, twirled and turned around. If you’re a foster-adoptive child that has trouble with balance or know where you are in space, these sensations are downright scary. We have witnessed first-hand that when the senses are overloaded that kiddos can either deflate or get more ramped up. 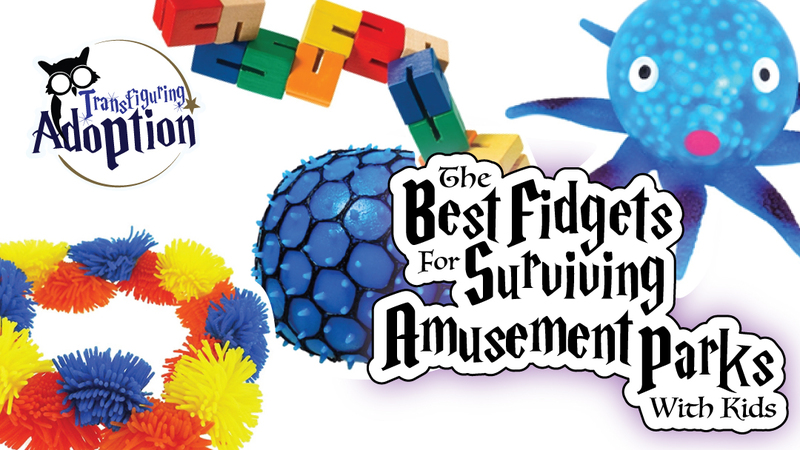 Fidgets have the ability for people to transfer that nervous energy and get it out of themselves. We tested out four fidgets from Office Playground. Let’s see how they tested. The Wooden Fidget Puzzle was quite fantastic for keeping kiddos entertained and calm while waiting in lines for rides. Our kids had a great time forming shapes out of the blocks. 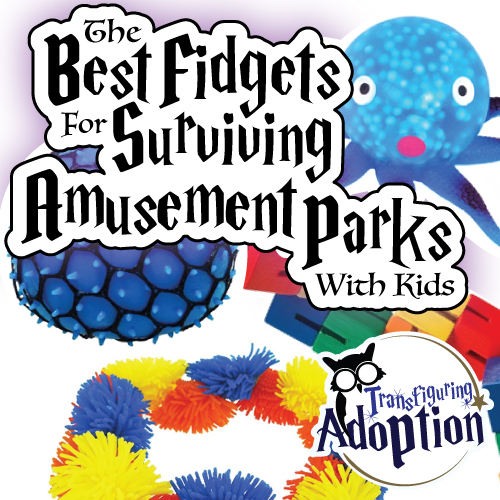 This fidget was very mobile and easy to fit into a pocket before getting on a ride. Since the blocks were made of wood, it made the puzzle very durable. As a parent, I gave it an “A” and my kids gave it an “A” also. What are ways that you survive amusement parks when your crew has sensory processing issues? For kids who like the squishy feel without all the mess, the Tangle Relax Therapy toys are great! There are different tangles with different textures, too, so there are plenty of options (and they’re pretty inexpensive.) I’m a young adult and I still use one to calm my anxiety sometimes! Autumn, we completely agree. At least three of us at Transfiguring Adoption have admitted that we LOVE playing with the hairy tangle just to calm our nerves. Thanks for chiming in and let us know if you think of any other fidgets we should review.